Collaboration is the engine of our custom design process. Our design team works closely with you to develop through understanding your vision and your project's unique success criteria. Before your fixture goes into production, you'll understand exactly what your fixture will look like, how much it will cost, and how long it will take to manufacture. In this project phase we ask a lot of questions, and we listen closely. What's the intended space for the fixture? From what directions will it be viewed? What tasks must the light fulfill? What style and sensibility do you want to achieve? Are there particular materials, textures or motifs you'd like to use? What is your budget and installation date? These and other topics guide our initial session. Sharing your project plans, furniture layout, sketches, design boards, finish samples or any other materials helps us better understand your aesthetic vision and functional requirements. This critically important exchange ignites the creative spark that fuels our concept work. Based on your initial input, we develop a series of concepts to stimulate further direction on aesthetic and functional design. We refine fixture style, dimensions and proportions, lens, shade and finish materials, diffuser requirements, electrification and lumen output, installation specifications, and other issues that impact fixture aesthetics and function, manufacturability, budget and ship timing. We gain agreement on design revisions, and provide you with preliminary pricing and timing from design approval to installation. Your approval of these documents gives us the go-ahead to finalize design specifications. Your design concepts are further refined to incorporate all specifications required for final pricing and production. Materials and finishes, canopy aesthetics, left vs. right facing orientation, mounting surface and J-box characteristics, light voltage, wattage and bulb type, integration with lighting control systems, doorway restrictions, light lift and on-site adjustment requirements and other specifications are finalized in this phase. We provide you with final designs, pricing and shipment timing. We also provide full-scale drawings, and we integrate designs into architectural plans so you can visualize your fixture in place prior to fabrication. When we receive your written approval and deposit, your design is released for production. Custom design demands flawless execution. At Hammerton, all of our operational teams reside under one roof, working together seamlessly to ensure that your project is executed as flawlessly as it is designed. This close collaboration yields higher quality, faster turnaround, superior service, exceptional value, and a very happy customer. In this project phase, a CAD model of your fixture is created to facilitate manufacturability and ensure proper function of all materials, components and precision parts. Our engineering team works with you or your contractor to verify installation specifics, including blocking and weight restrictions, wattage and amp requirements, hardware, light lift and assembly instructions. With your approval of final engineering drawings, materials and finish samples, your design goes into manufacturing. Customers who have toured our facility will tell you: magic happens here. Your design is brought to life by a team of world class artisans: metal fabricators coax form and texture out of hot steel, glassworkers sculpt elegant lenses, finishers apply proprietary patinas and paints, detailers craft shades, domes and other accents. Our artisans share an eye for aesthetics and a relentless obsession with detail, incorporating each element by hand to ensure superior quality and character. The result is a beautiful work of art that is uniquely yours. Our job isn't done until your fixture is fully operational at your jobsite, so we take special care to ensure that it ships securely and installs seamlessly. Your fixture is custom-crated and ships with side-marks and detailed documentation to facilitate on-site logistics and installation. We coordinate inspection, delivery timing and installation equipment needs with you or your contractor. You may even see our designers, engineers or field service professionals onsite, making sure the project goes without a hitch. 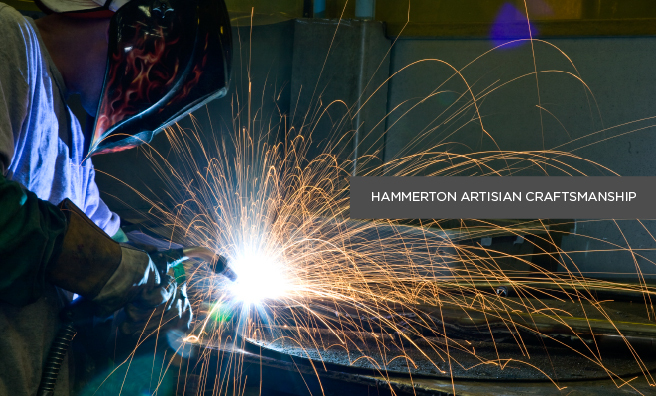 Rest assured that Hammerton will be with you until your custom project is successfully complete. Take a look at our custom project Case Studies and galleries. As design professionals can attest, successful lighting design involves many details that require attention during project planning and early construction. All too often, many important lighting design decisions — involving wiring, electrical service, j-box locations, lighting control systems, mounting surfaces, installation and other considerations — are left unaddressed until rough electrical is complete and wall material is going up. This typically results in expensive change orders, lengthy construction delays and unforeseen compromises in the overall lighting plan. 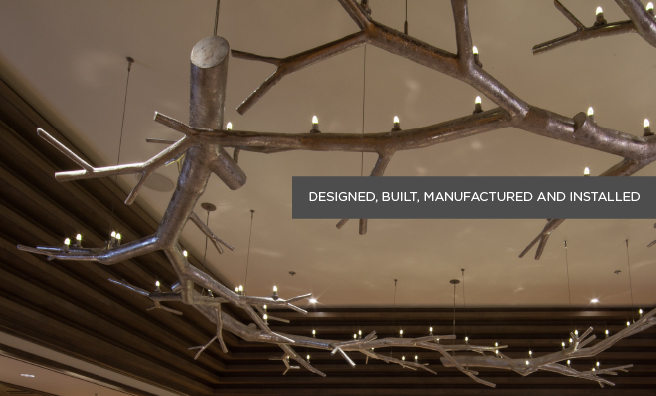 The good news is that Hammerton has been designing and manufacturing custom lighting for over 2 decades. So we've seen it all, and we know the right questions to ask early on in the build process. A few of the most frequently overlooked lighting considerations are outlined below. Contact your representative to learn more. Are the breaker, wiring and lighting control systems equipped to service all lighting requirements? Have the weight and dimensions of large fixtures been addressed during the construction phase? Are j-boxes correctly installed in the proper locations? Will a fixture mount to its intended surface? Check the pitch of your ceiling, is it sloped or flat? The pitch determines what kind of mounting options will work best with the desired light.